How can I use TNObject in manager class for sending RFC commands? Use TNManager.LoadLevel, it'll load the level for all network clients. Yep, TNManager.LoadLevel - work is fine, but I try to send RFC - and its dont work for me, how its is possible to have only one Canvas in start scene(with GameManager class for manipulation all states of the game and sync network values - like: time, mode etc before start GameLevel)? 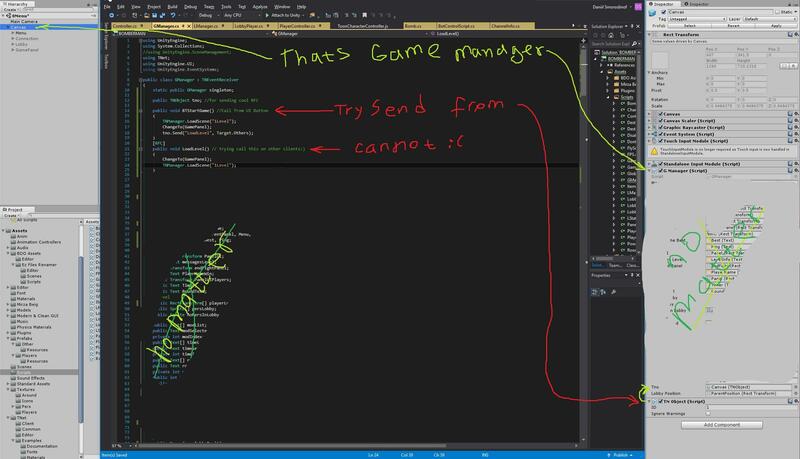 then players connect to lobby - they dont load new scene - they are stay in the first scene - and there need some network sync(sync work between created UI prefab with TNObject[with dynamically ID]): how there host with TNObject on gameManager class can send RFC to others? You can't network objects without being connected to a network you have to join the server and a channel first. After that you can instantiate your networked objects and send RFCs with them. Static TNObject's aren't recommended anymore because of the multi-channel stuff. To clarify: you can't (shouldn't?) network objects post-connection. They shouldn't exist until you've joined a server and channel. oh, Thanks so much!!! TNObject work only after TNManager.JoinChannel and TNManager.Instantiate. ohh No, I still have this problem, I dont understand - How send RFC from GameManager class to other clients? I have two or more TNObject(for each player) in hierarchy of Canvase(GameManager) - thats should not working? I'm having a hard time understanding you. Make whatever networked object you're trying to use a prefab with a TNObject (id of 0) and use TNManager.Instantiate when you join a channel. Everything will work then. I don't know what use case you're trying to make work, so that's the best, most generic advice I can give. Also, you could refer to the tutorials and the example scenes packaged with the TNet asset to see how certain practical tasks are accomplished. 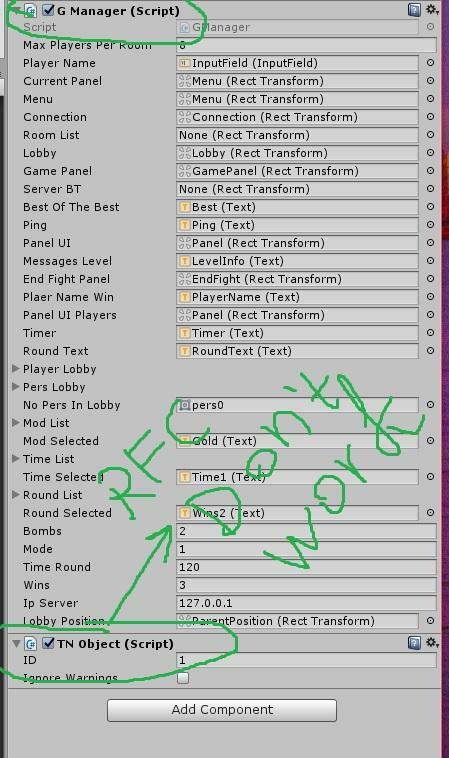 Well: I try to make - all player connect in lobby(one channel), and Host can send there RFC(setUp additional game options) - and after that send for everyBody start the Round. I'd have GameManager inherit TNEventReceiver then override the OnJoinChannel function. In that, I'd check if we're at the lobby portion of the game and instantiate (via TNManager.Instantiate) a LobbyManager if it doesn't exist. This LobbyManager has the TNObject component with id of 0 and handles all lobby-related RFCs while in the lobby portion of the game.